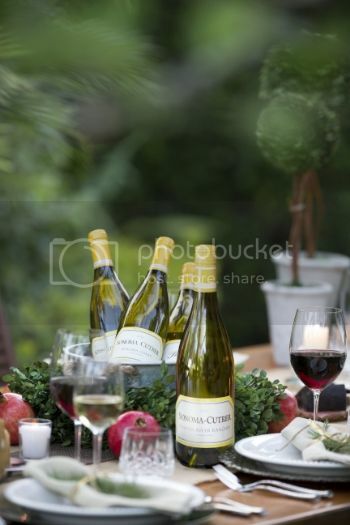 This is a Sponsored post written by me on behalf of Sonoma-Cutrer Vineyards for SocialSpark. All opinions are 100% mine. Sometimes food inspiration comes to you at random times. For example, did you know that September is California Wine Month? Over the years my husband and I have grown pretty fond of wine and pairing it with foods. Like the classic Sonoma Coast Chardonnay, which is nutty and buttery and tastes phenomenal with these shrimp, which are so light and refreshing. It’s a match made in heaven. Pairing wines is not nearly as complicated as some make it out to be. In general, if it tastes good together to you then it’s a good match, it’s that simple! But to break it down, I like to approach it the way I do decorating. The general rule of design is that you use complimentary (colors opposite from each other on the color wheel) or analogous colors (those that are next to each other). So, for example, you could pair a spicy dish with a contrasting flavor like a light, fresh bubbly wine or you could go with a wine with a hint of spice to it as well– say a zinfindel. Anyway, back to this dish. It’s a little special because you mix the sun-dried tomatoes with the egg wash, so those little bits get all mixed into the batter. The creamy panko crumbs plus those little bites of tomato blend so well together! I think I could eat this dish every single day. I served mine over orzo (which I tossed with sundried tomatoes, a bit of tomato pesto and fresh feta cheese), but I think they would compliment any pasta or make a great stand-alone entree. Whisk together eggs, water and sundried tomatoes. Take a small skillet and fill it with an inch of olive oil and heat on medium (a temperature of around 350 degrees). Prepare your shrimp by coating them one by one in flour, then in the egg-tomato mixture, then coat in breadcrumbs. Place several shrimp in the skillet , heat for 3 minutes and then flip over. Heat for another 3 minutes. They will be a crunchy, delicious golden color when they are finished. For more ideas on how to serve your favorite wines, check out @SonomaCutrer on Twitter, Sonoma-Cutrer on Facebook, Sonoma-Cutrer on Instagram, or directly on the Sonoma-Cutrer website!